This is my first attempt at Turkish Delight. Alas, it was not a great success. It looked good (at first) and it tastes good but it is not firm enough. After this photo was taken, it sweated so much that all the icing sugar/cornflour coating melted and it became a sticky mess. What a pity – I had high hopes for it. It is currently in the dehydrator being saved, I hope. I have wanted to make Turkish Delight for ages. Maus loves the stuff and I am also a little partial to it. I was going to make Claudia Roden’s recipe but, as is the case most of the time, the recipe I wanted was in Perth and I am in Bridgetown. Because my first choice was not available, I decided on the recipe from Peter Greweling’s Chocolates and Confections which is a great book. I have had success with everything else I have made from this book so I felt confident his recipe would be a good one. The recipe is supposed to be easy, but I don’t know… The only change I made was to replace 2 tsp of rose water with 2 x 15 mil tablespoons. I just love rose water and 2 tsp did not seem much. Otherwise, I followed it to a ‘T’ and still it did not work. It appears that I am not the only one who has had trouble with the recipe. I found a forum where some poor bloke had the same problem. That is where I got the idea of trying to save it by putting it in the dehydrator. Some one suggested he do that. Another suggestion was to coat it in chocolate. It appears the chocolate holds it all together. I may try that when I take it out of the dehydrator. 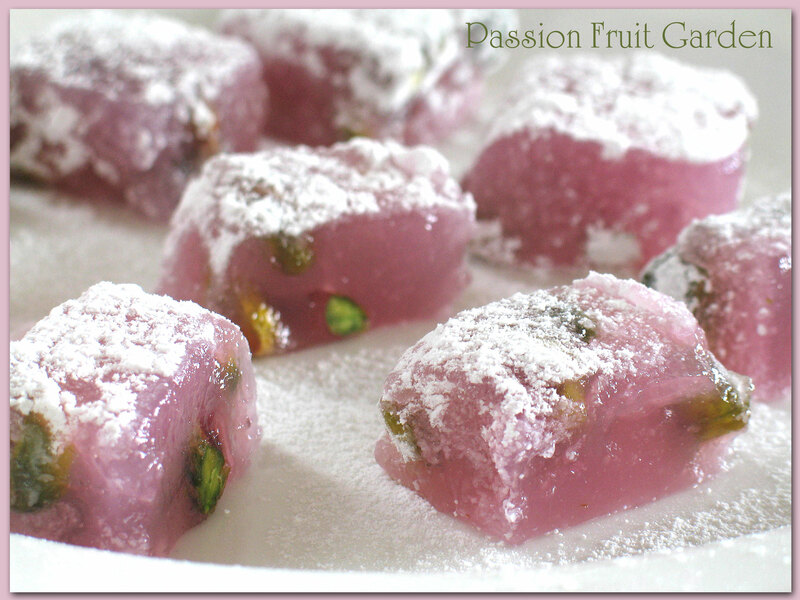 There are a multitude of Turkish Delight recipes out there and they are all different. There are recipes with cornflour and no gelatine, recipes with both and recipes with just gelatine. Now that I have read into it a bit, I have ascertained that the traditional method had no gelatine in it. Gelatine, it appears, is the cheats way 🙂 Essentially, it is to speed up the process and make it set. From what I can gather, I did not cook mine long enough, notwithstanding I cooked it for 25 minutes and the recipe says 20-25 minutes. Since this attempt, I have noticed other recipes without gelatine usually require the mixture to be cooked much more than 25 minutes. One recipe on YouTube says to cook it for one hour and Claudia Roden requires it to be cooked 3 hours. What hope did mine have? I will give you the recipe just in case you are brave enough to try it. If I try it again, I would use less nuts. They are a bit overwhelming. I think the decision to use more rose water was a good one. Another tip I found in the forum was from a fellow who had Peter Greweling’s professional book. In that book, Peter says to cook the concoction until it reaches 223°F (106°C). He said he was going to try that next time. I might, too. He also said he would use more rose water and fewer nuts. If anyone tries the recipe, please, let me know how you go. I need all the tips I can get. Please, note: As this book is American, measures were, originally, in pounds and ounces. Lightly oil a 9×13 inch (22cm x 33cm) baking pan, then line it with plastic wrap. Combine the sugar, water and cream of tarter in a small saucepan. Slowly bring it to the boil, stirring to dissolve the sugar. Once boiling, turn the heat down, cover and boil for 4 minutes. After 4 minutes, remove lid. Continue cooking (do not stir) until the mixture reaches 260°F (126°C). Remove from heat and set aside. In a medium saucepan, mix all the starch paste ingredients together. Stir with a whisk over medium heat until the mixture starts to thicken and boil. Cook for an additional 2-3 minutes. Gradually, in a stream, add the sugar syrup to the starch paste, whisking all the while. Remove the pot from the heat and stir in rose water, colouring and nuts. Pour into the prepared pan and lay a piece of plastic wrap on top. Leave to cool for 5 hours or overnight. In a large bowl, sift together the icing sugar and cornflour. Cut the Turkish Delight and roll it in the sugar mixture. This entry was posted in Sweet Things, Treats/chocolate and tagged How to save failed Turkish Delight, My Turkish Delight did not set, My Turkish Delight was too soft, Peter Greweling Turkish Delight by Glenda. Bookmark the permalink. I know this is 2 years later, but I have the same book and his recipe is so wrong. There is no way you can make Turkish Delight in the time he suggests. I’ve made it successfully in about 45-60 minutes. Hi Melissa, what recipe did you use? I would love to try it. Hai Glenda. How is your turkish delight going? I’ve tried recepi from youtube Titlis kitchen, first trial is so great, everything is going perfectly. But the second and third trial is a messed. The problem is because I tried to change the ingredient with adding 50ml of lemon out of 1tbsp and ml of water out of 375ml, and 750gr sugar out of 800gr. I dont understand why. In my opinion it should be going well since the its have less liquid. But the original recepi is great, go and try it. Hi Lina. I will try it. Thanks for the link. I have no idea why it sweats. Glenda Your post reminds me of this quote from Voltaire’ “perfection requires the hand of time” or something along these lines. I find that delicacies and delicious things take experience to perfect. Your images look like those delights tasted exquisite. Next time you make them they’ll come out the way you want them to. I also feel crushed when something falls apart..
Hi Lara. I haven’t tried again. I should. Maybe this winter. Moya, I would love an authentic recipe if you happen to have one. I have a few recipes but I am not sure which is the best. I don’t know anything about Turkish Delight but I think it looks beautiful. Ok, maybe it fell apart after the photo but you got some very enticing shots there. It’s funny that you haven’t been blogging because you’re freshening up your yards for spring while we’re busy putting ours to bed here. Hi Jane, I am definitely going to try again. Lucky all the failures are yummy. Thanks Sandra, I sure will try again. I think I’ll wait for you to crack it before I try to make it. I’m rather partial to a good Turkish Delight especially rose flavoured, though I’d have no qualms about eating home made even it was less firm than desirable. Spring is a wonderfully (mostly) time of year. Sorry your Turkish Delight didn’t quite work out. Reckon I would eat it as is though – what a piggy. I have found the most magical Turkish Delight so never thought to make it myself. Have a super weekend Glenda. Hi Glenda, I can only imagine how busy you must be! Pity about this recipe not working out! 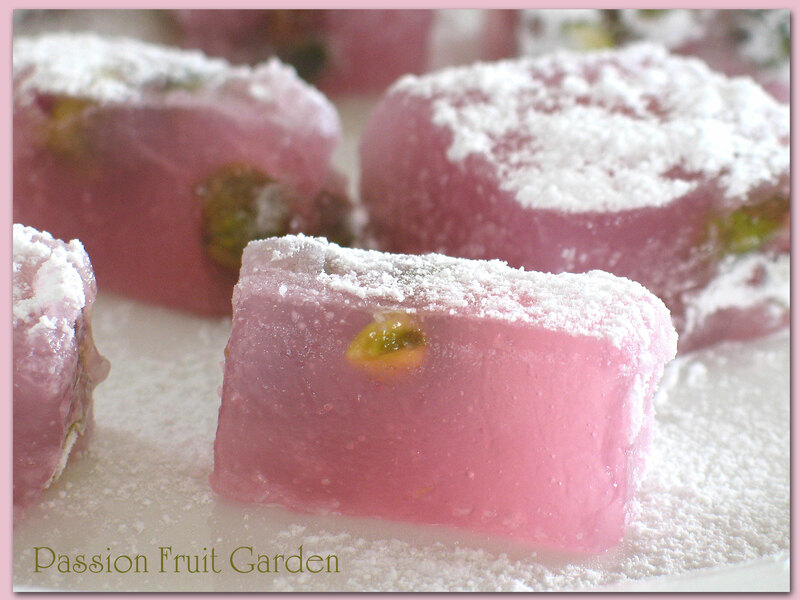 I’ve been wanting to make Turkish delight for ages too!